My final addition of brewery companies, with a 4% weight, is the Swedish cider company, Kopparberg. The company has been selling sweet fruit cider (and beer) for many years in Sweden and later expanded to the UK. Kopparberg was the first entrant offering a sweet fruit cider in UK, which was more or less unknown to the British. Kopparberg have managed to break into this market and create its own niche and it has been a roaring success in UK. 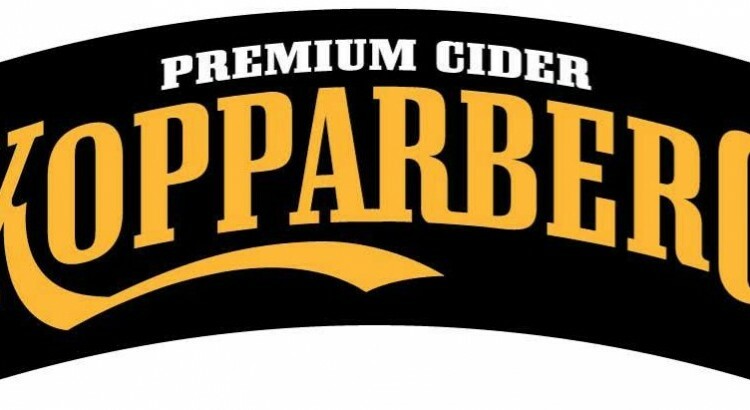 Kopparberg has some 60% of its world-wide cider sales towards UK today. Naturally as a Swedish producer the GBPSEK rate is important to the margins of the business and Brexit was not helpful in this regard. Given the companies success in this new niche of very sweet cider, there has of course also been competition that has stepped in. For example Carlsberg Somersby which has also seen extremely strong growth. With results at current level, the stock is fairly valued and downside is a more general multiple contraction in (brewery) stocks. So I keep this at a lower weight for now, waiting for a more clear confirmation of a turn-around and/or further sell-off, where I would be inclined to add to my position. Nevertheless, I’m impressed by the execution of the Kopparberg management and their track-record. I like that the CEO and founder holds a large chunk of shares. My main thesis for investing at this point, is a normalization of the margins for the UK market, which gives the stock some upside and also that I believe the product will be successful in other markets/countries (with USA being the number one target). I currently hold about a 4% position in both Olvi and Diageo. Diageo is one of the worlds largest brewery groups with a tilt more towards spirits, like whiskey, I’m fairly happy with my holding right now and a larger sell-off would be needed for me to consider adding to my position. Olvi is mainly a beer brewery focusing on Finland, the three Baltic countries and Belarus. Whereas both stocks have traded down slightly since I bought I have been looking more closely at Olvi. The company is in a great position macro wise. The Baltic region is growing very nicely in terms of GDP and economic outlook. Olvi has a very large market share in these markets and just growing at the speed of the local economies will give a significant revenue boost. I believe Olvi is one of the cheaper brewery stocks out there at the same time as they are exposed to some of the countries with very good macro backdrop. I choose to add another 2% to my position here and very much look forward to an interesting report announcement tomorrow. Finally Nagacorp, which has made a tremendous turnaround since June, when I decided to add to my position (Double up Nagacorp). The sell-off at the time, was more related to the behavior of the majority holder, rather than any company fundamentals. At that time I added 6300 shares at 3.61 HKD, today I slice my holding with 4300 shares at 7.49 HKD, more than a 100% gain in 9 months, very decent indeed. The explanation is two-fold, the majority holder was not allowed by the HK regulator to cheat the minority holders, this gave a quick bounce up when that issue was resolved. The second reason is that the expansion of the Casino has been a real success. And the latest figures that came out, shows an almost unbelievable growth of VIP rollings. So what I have been saying about the revenue growth all along came true and then some. Thanks to (un-audited) voluntary announcement of the 9/3 month results (which only gives some basic information), we can even see how much VIP rolling grew the last 3 months (in million USD). 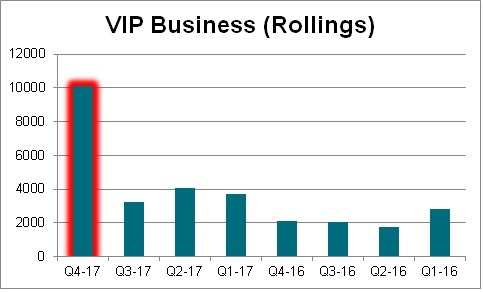 As you can see, the VIP rollings is presented as an 142% increase YoY, but this increase is mostly driven by the Q4 on Q3 increase of 212%, which as previously stated, is almost unbelievable. Looking at seasonal figures, Q4 is not even a strong quarter, Chinese New Year and so on makes Q1 and Q2 more profitable. So what can we expect from Q1 2018? Well it’s already off the charts, but say the yearly VIP rolling 2018 comes in 4x the Q4 2017 rollings, we have full year rollings at 40,500 million USD. 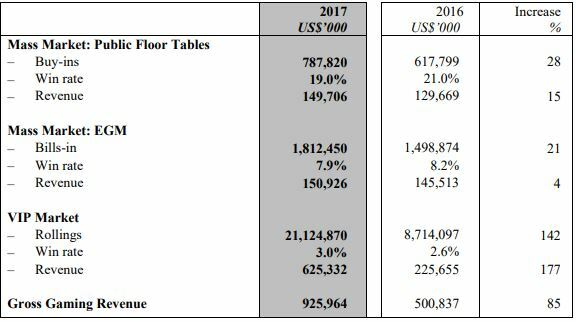 If we take the average win-rate of 2017/2016, we get Revenue of 40500*2.8% = 1134 million USD. The Gross profit margin is lower for the VIP segment, again at an average margin rate of 28.5% this gives us Gross Profit of 323m USD. With other segments at constant revenue and cost this boost Profit before tax with 65% from 263 to 433m USD. Converted into EPS it goes from 0.47 HKD to 0.77 HKD per share, meaning that Nagacorp is trading at a Forward P/E of about 10 currently. With 60% dividend payout ratio policy it get’s pretty interesting. Why I am reducing my holding? When things looks so damn good, why am I then cutting my holding? Well reality is not this easy to keep everything constant and just adding VIP rolling growth, first of all, I believe costs will go up as well. Getting this kind of growth in VIP rollings must come a price. The price is paying the junkets for bringing in all the high-rollers. On the flip-side, the highly profitable Mass Market segments is also growing nicely. Another concern is tax, which is again bound to go up (its a yearly negotiation between the Cambodian government and Nagacorp). But really what puts me off is the majority holder and his behavior throughout the years. How he tried to cheat everyone through the double dilution of his convertible bonds price adjustment was very distasteful. Another example, every year he awards himself a massive bonus. Why this bonus even exists is very unclear, he then “kindly” defers it, meaning it won’t affect that years results. It’s a pretty chunky sum of money “Dr Chen will be entitled to a performance bonus of US$11,765,321 (the “2017 Bonus Entitlement”) for the financial year ended 31 December 2017. “. So I keep saying in my comments about Nagacorp, this is money printing machine in a region with tremendous tourist growth. With a better majority owner I would be happy to hold 12-14% of my portfolio long-term in this stock, but now it’s a love/hate relationship, where you are just waiting for the next betrayal. So for that reason more than anything else I hereby take some profit, although I easily could see this stock at 10 HKD before year end. Yes very good, but the VIP rollings came in much lower than Q4, still a good figure but still the Q4 figure is unreal, what really happened in Q4? Yup saw the comment about Q1 vs Q4 in GGR from Grant Govetson. Anyone have access to the full commentary? Q4 was launch so maybe it was easier to attract the whales? You are right though worth to monitor this aspect. Today a pretty good decline, do you have any idea why ? Is this related to Q4-Q1 concerns ? The market is down. -2%. All the casinos are down. I’ve noticed that every now and then this stock has a lot of short seller activity. Today’s volume is around about the volume the stock normally gets for more than a week and in absence of any indication otherwise, I am inclined to think it is just the usual. I was thinking of selling / taking profit when I saw the massive dive but struggling to justify without any sale without data points to indicate fundamentals have shifted against it. So for now, I still hold. Well in my view I was surprised at the big increase yday. If Q1 figures were confirming Q4 VIP rollings then we will be heading quickly to 10 HKD, but they did not, so far anyway. So i think 7.5-8 HKD is a reasonable range. If Suncity now can grow VIP back to Q4 levels that would be the short term upside in my view, have to wait another quarter for that data though..
Naga up 10%+ today now that MS has initiated bullish coverage. Haha indeed, I like it very much, but indeed we have to look close to the funding of the Vladivostok expansion and of course the majority owner Chen. He has high ambitions for Nagacorp and if he want’s to achieve that he should keeps his hands out of the cookie jar. Have you ever looked at Imperial Pacific International ? Agree with assessment on Naga. But for now I hold with a close eye on Macau monthly GGR and quarter by quarter review of Naga results to determine whether to sell my position or not (one of the attractions of Naga is that I believe the drivers of share price are pretty easy to understand in this business). Positives are a massive growth story oppprtunity this year. Naga2 only had a soft opening from Nov and the ramp up has been super exciting. A deal was inked with Macau’s largest junket recently and It still trades at around 50% discount so the potential narrowing of the valuation gap also presents an opportunity. Despite some sabre rattling from Ros Phirun (deputy director of ministry of finance), another one off tax item was not repeated. The rumored rates for the new gaming tax law will also not have a material impact on profitability. Costs were up quite a bit this year vs last year with the company stating that these costs were necessary to boost revenue. Expect further cost increase this year as nagaworld (the aging part) is now showing signs of its age. Lots of complaints from the internet about smoky smelling rooms etc..
Concern no.1 is how they will fund Vladivostok expansion and whether it is still a good expansion opportunity. Another placement would be bad and I will assess the likelihood and whether Vladivostok will be positive for Naga in the coming months. In response to Bart, numerous complaints from Summit Ascent and fears of delayed development and an impact in attracting new operators to the region has cause the regional government to freeze the tax rate. 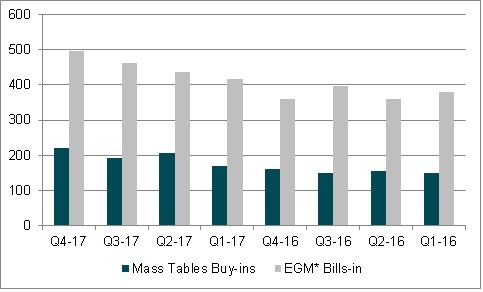 The ramp-up of summit ascent did not live up to expectations last year due in part to competition from illegal gambling venues and as a result companies are reluctant to bid for more casino licenses – this means the hopes for a Macau like cluster effect may not come. The annual results for summit ascent are out soon and will be helpful proxy to evaluate the expansion story. Finally, I do agree that this bonus to Chen is a very annoying cloud hanging over the share price. If it is ever exercised, past experience tells us the market will react violently . Chinese New Year could show some massive rollings this time. Don’t you think the costs are up, like I said because they need to pay the junkets to get in the VIPs? Interested that you dig into user reviews on the rooms. I still have not had time to visit the casino myself. But that must the case, Nagacorp has also stated the need to refurbish the rooms. Yes I’m very worried about how they will move forward with Vladivostok. If the Bonds would be converted, Nagacorp would actually receive a fairly large sum of money in the conversion, from Tan Sri Dr Chen Lip Keong. That would probably be enough to solve early funding of the project. But he is probably happy to keep his stake as bonds for the time being, since he still receives the full dividend. I think the Junket fees are a necessary evil to drive revenue and profitability. I am not overly concerned about the fees atm since they are producing healthy revenue growth. I thought the convertible bonds have already been converted? You are right, I was fooled when I looked at the cash levels. Somehow the cash from the conv bond has been used up already in Naga2, I don’t really get it though, that was a huge amount of cash ~350m USD. I have to look in more detail at the latest report when I have time. I think the entire bond was merely converted into equity. If memory serves the bonds were originally issue in consideration for assets (naga2, naga city walk) with Chen being entitled to dividends when the projects were of a certain maturity. The conversion price of the bond then just determined how much is minority share holding plebs would get diluted. So this article is not up-to-date anymore ? The summit ascent results fared quite well 13.8m hkd vs 560k hkd in 2016. Let’s hope the management doesn’t screw up the funding of Vladivostok and the contingent bonus thing. If I see solid Q1 ggr then I will continue to hold. If GGR grows as much from Q4 figures as it usually does over Chinese New Year, I think we will see 10 HKD. Anyone that read the whole analysis from Goldman? They put a target price of 5.9 HKD and Sell rating..
I’ve been a reader of the blog for some time,nice work! 1: The government recently liberated sale of beers,long drinks etc of alcohol content of over 4,7% which were previously exclusively sold at Alko (local state alcohol monopoly stores) to grocery stores. This is imo a headwind for Olvi as it adds international competition at the stores which has not previously bothered to manufacture the low alcohol beers sold in Finland. 2: Olvi has strong market share in the baltic countries particularly Estonia,who have had a low alcohol tax and very low beer prices compared to Finland as a consequence. A lot of Finns have traditionally travelled from Helsinki to Estonia by boat and bought a carload of cheap beer (often one of Olvi’s baltic brands)because the price difference was so great,so it has been worth the trouble. Estonia has repeatedly raised the alcohol tax recently so it isn’t so cost effective to buy from there anymore and again competition in Finland will increase because of the government decision to liberate stronger beers to grocery stores. I still like Olvi a lot because it has been a very stable conservatively run family owned company but will sit on the sidelines a bit longer to see how they adapt to the legislative changes. Nice to see a Finish reader commenting and thanks for the good input! 1. Very good point and something I haven’t really understood. But is it really the case that Heineken and such has not bothered to produce a lower alocoholic option, I thought they already had that? 2. But if we forget about the liberated sales of beer, stand-alone that Fins actually by their beer in a more expensive market, like Finland, would be net positive for Olvi as I see it? 1. How do you think Royal Unibrew has handled the Hartwall part since they took over? Have they been gaining market-share or rather lost market share trying to lift margins? 2. How popular is the craft beer/IPA trend in Finland? I’ll try to answer as best as i can quickly. 1.Finns tend to buy a 24-pack of beer or at least used to and usually the one brand which is on sale in the store chain they tend to do their shopping and typically the brand on sale is one of Olvi,Sinebrychoff or now Royal Unibrew owned Hartwall,Carlsberg brands sometimes,Heineken i haven’t seen ever on sale. There are only 3 big grocery retail chains in Finland who have massive negotiating power on local beverage producers, K chain,S chain and Lidl (others are combined about 10% of market) of which Lidl is growing and mostly only offers its private label beers on sale,others are also marketing their own private labels now some made by Olvi,propably on lower margins. Olvi,Sinebrychoff,Unibrew are the bulk producers and i think they are pretty evenly matched,Unibrew has rationalised the cost structure in Finland(moved all previously very locally produced iconic brands to one factory)etc. and their brands have lost some share to Olvi in recent years. of beer is still sold in bulk and is cheap lager,the small producers are having difficulty getting their product in the stores i think because the retail is so concentrated here and has so much negotiating power. There is definitely uncertainty in the beer market because of the legislation change happened only a few months ago and the results of it begin filtering through in the coming year or two,nothing much may happen of course. Also Olvi has a succesful operation in Belarus which is doing well but wild currency fluctuations have regularly affected results there. Overall I’d say the company has executed its business well for a long time everywhere it does it but is affected more than bigger players by local tax,concentrated retail,legislative changes and in Belarus’s case the currency,none of those things of course it can affect itself. Thank you for the blog,i read it every time with interest! Hi, I also hold Nagacorp, that’s how I found your site (searching for more info). I totally agree on you about the majority holder. I hope this guy understands now that he earns more money out of stock appreciation when he plays it honest. What’s your take on the russian project, the proposed new taxation is also an issue don’t you think? I saw some analyst adding 1 HKD per share in value due to the Russian project, I would rather give it a negative 1 HKD per share right now. Look at Summit Ascent that I held in the past. Taxation I think will just slowly go up, year by year, it is still a decently low tax level.